To a large extent, cruising is about experiences - - seeing new places, meeting people, doing something different. However, one experience that no one recommends is a bout with the noro virus. Gastrointestinal viruses are the bane of cruise ships and cruise ship passengers. For the cruise lines, outbreaks generate bad publicity and require substantial amounts of additional work as well as expense. For passengers, the disease is a short but nightmarish experience that leaves you exhausted. I know because I recently went through it. Commonly referred to as the “noro virus,” the Norwalk virus is just one of a number of gastrointestinal viruses. These viruses are quite common and, according to the U.S. Center for Disease Control, affect some 19 to 21 million people each year in the United States. Particularly prevalent in the winter months, they are highly contagious and thrive in places where people are together in close quarters such as classrooms, nursing homes and cruise ships. There is nothing glamorous about this disease. The virus makes its home in the gastrointestinal tract and spreads from person to person via feces and vomit. Invisible to the naked eye, it can be transmitted when someone who is infected has not properly washed his or her hands after going to the bathroom and then prepares food or shakes hands with another person. It can also be transmitted by touching a surface that was touched by an infected person and then touching your mouth, eyes or face. The noro is not the type of disease where you have it once and you are immune for life. I have experienced it twice in more than 230 cruises. A very low percentage but twice is enough. ​This disease is not confined to any one cruise line or to any category of cruise line. It can strike on mass market ships, premium ships and luxury ships. The cruise lines spend considerable effort to prevent it - - cleaning frequently, deploying sanitizer stations and advising passengers on how best to avoid the disease. Some cruise lines take the precaution of having their staff serve meals in normally self-serve venues on embarkation day because there is a greater likelihood that that people may not have washed properly while traveling to the ship. There is no 100 percent effective preventive measure so the objective is to reduce the chances of catching the virus. At the top of the list of preventive measures is to wash your hands frequently with soap and water. That is one of the reasons that you see basins and washing stations outside of the buffet restaurants on an increasing number of cruise ships. 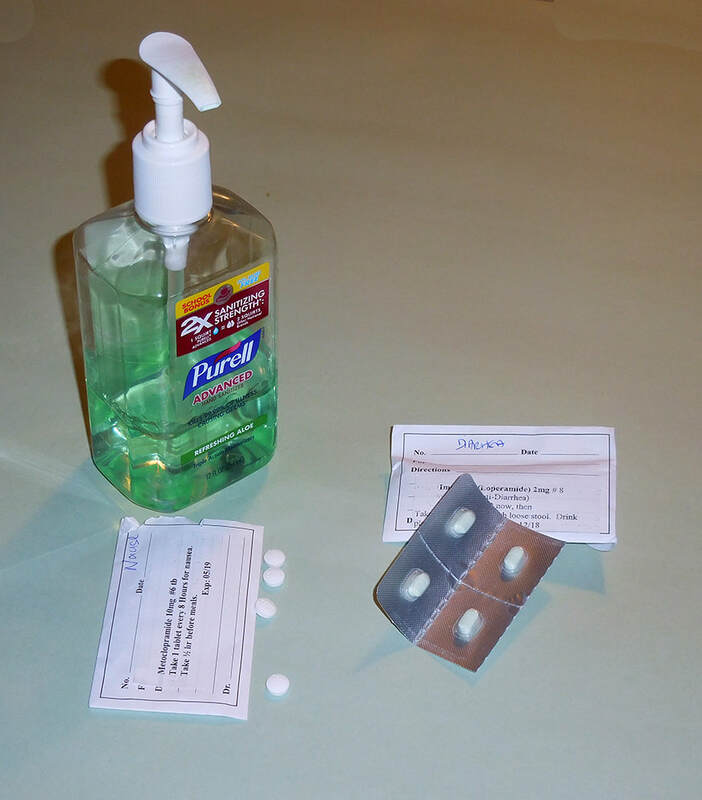 Alcohol-based hand sanitizers can be helpful but are not a substitute for a thorough cleaning. Personally, I try to avoid touching surfaces that other people may have touched. For example, in elevators, I press the buttons using my sanitizer bottle and in buffets, I try to wrap a napkin around the serving utensils. Things like touch screen signs, I simply avoid altogether. I began to feel uncomfortable late in the afternoon of the next to last day of the cruise. At first, I thought that I had simply had too much to eat and drink at lunch. Perhaps taking a stroll around the ship would make me feel more comfortable. On my stroll, I noticed some signs that there was a noro outbreak aboard. The crew were out cleaning at an unusual time and puddles of disinfectant were visible on the stair rails and on hard surface furniture. Other telltale signs are when condiments disappear from the dining tables, the fitness center is closed and the buffet is no longer self-serve. Although I did not feel sick at this point, I decided that the prudent thing to do was to return to my cabin and forgo dinner. Maybe my discomfort would pass and I would feel better in the morning. My hopes were unfulfilled. As the evening progressed, I started to feel ill. This feeling blossomed into violent vomiting and diarrhea. All I wanted to do was sleep but such attempts were interrupted by frantic dashes for the bathroom. I drank as much water as I could because I had heard that there is a danger of dehydration in such situations. I was awoken the next morning by the sounds of the room stewards cleaning the nearby cabins. Although I was still tired, I no longer felt nauseous. At the same time, I was not hungry. Nonetheless, I decided that I would call the ship's medical center. The general practice in the cruise industry is to confine passengers who have shown signs of the noro virus to their cabins. This is to prevent this highly contagious disease from spreading to others. Thus, I knew that by making this call, I would be placed in quarantine for the rest of the cruise. However, it seemed like the right thing to do. This is not an experience you want to share. Furthermore, although I had made some attempt at cleaning, the state of things would be readily apparent to my room steward when he came in for the morning cleaning. In any event, all I wanted to do was go back to sleep. It took quite some time for someone from the medical center to arrive at my cabin. From what she said, I had the impression that she had made quite a few such calls that morning. She took my temperature and blood pressure and checked to see if I was dehydrated. (There was a slight fever and some dehydration). I had to fill out several forms. She then gave me some pills (Imodium and metoclopramide) for the diarrhea and vomiting. To encourage passengers to report noro illnesses, there was no charge for this medical consultation. I also learned from the handouts that she left behind that the on-demand pay television would be complimentary. In addition, I could obtain complimentary bottled water and Gatorade by calling the guest relations desk. After sleeping for most of the day, I began to feel more lively. My quarantine was on the honor system. There was no force field or armed member of the security team standing in the hallway outside my door. The handout said that my room key card would set off an alarm at the gangway in any port of call the ship visited but all that was left to this cruise was a sea day. However, the thought of inflicting on others the experience that I had just gone through was enough to keep in my cabin. I contented myself with watching movies. I also speculated about how I might have contracted the virus. Two possibilities occurred to me. First, I had had problems getting a good internet connection from my stateroom. Therefore, instead of using my own devices, I had used the ship's computers in the internet cafe to check e-mails. Although I had wiped the keyboard with a sanitizing cloth, this incident did involve touching surfaces that could have been touched by an infected person. Second, I had attended a luncheon in which bowls of food were placed around the table to be shared “family-style.” The cruise lines love this sharing concept because it seems communal and relaxingly informal. However, if one of the people who is sharing is infected, he or she is passing along the virus when he or she passes the bowl and its serving utensils to the next passenger. Also at this luncheon, there were seafood and shell fish. Such foods are quite susceptible to contamination. Although not a top priority under the circumstances, complimentary meals were available from room service. The handouts listed a number of items that the medical center recommended and a number of items that were to be avoided. When I called room service, I found that the items on the recommended list were the only items that I could order. When delivered, the food bore no relation to the tasty food that I had enjoyed during the rest of the cruise. But then I was not looking for flavor, only to get some food into my system, which had been emptied the night before. During the course of my confinement, several people came to the door, making deliveries and asking if there was anything that they could do. Some were understandably nervous about talking to someone known to have a contagious disease. Most seemed genuinely concerned and eager to help. Since I could not go out, my link to the outside world was the telephone. At first, the people at the other end of the line seemed sympathetic. However, as time wore on, their voices became more abrupt. My surmise was that the outbreak was causing nerves to become frazzled. Sick people can be rather demanding. The next day was disembarkation. I did not receive any information about how people in quarantine were to leave the ship. As mentioned earlier, one of the handouts said that my key card would set off an alarm on the gangway so I thought that there must be some special procedure for leaving. When I phoned guest relations, they said indeed someone would come up and help me off the ship at an appointed time. The appointed time came and went. I called guest relations again and was told that someone would be right there. Another hour passed and still no one appeared. From the announcements that I could hear coming over the ship's public address system, the disembarkation process was coming to an end. Guest relations were no longer answering the telephone. While this was annoying, it was understandable. The outbreak must have been putting a strain on resources. In addition, you could see why a crew member might be reluctant to take on the extra duty of escorting people known to have a contagious disease. Therefore, I went down to the gangway on my own. There I found a number of quarantined passengers who, from what they were saying to the besieged guest relations staffer who was at the gangway, had also been waiting for hours for promised escorts. The staffer then took everyone through security and into the terminal building where we became part of the general public once again. The one good thing about a noro experience is how good it feels when it is over. Even though I did not feel 100 percent for some time after, it was such a relief in the immediate aftermath.